We utilize TOYO molding machines ranging in size from 55 to 500 ton, both electric and hydraulic. 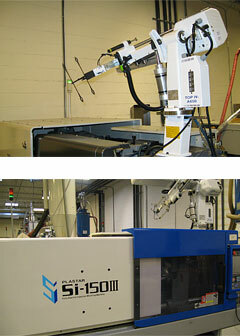 We optimize our personnel by utilizing robotic part handling on our machines whenever possible. This is one of many ways in which Wilco maintains control over its efficiencies and costs. See some samples of projects that we have worked on! To get a better idea of the variety of plastic injection projects that we have developed and assembled, click here to view project samples that demonstrate our expertise!